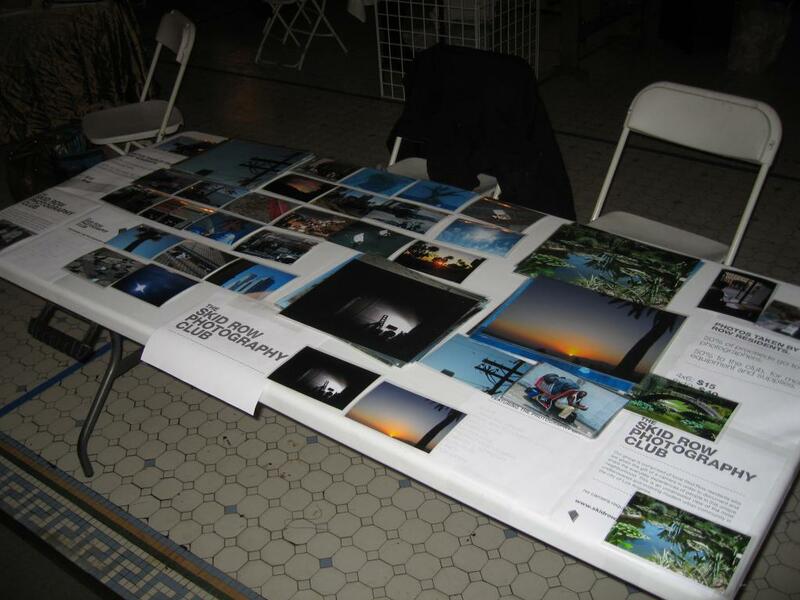 Last weekend the Skid Row Photography Club sold a dozen prints during the Old Bank Block Party's Holiday Art Bazaar. The turnout was amazing. Hundreds of people took time to look at our club member's amazing photos. Everyone was enthralled by the quality of the work and excited to learn about the concept behind the club. I felt like a carnival barker luring marks to the table, but it was for a cause more noble than a ring-toss. My hard-sell helped to bring people to the table who otherwise would have just passed by. This in turn helped to sell a dozen prints. The deal we have worked out with the club members is that half of any print sales goes to the club and the other half goes to that member. Yesterday at our meeting I handed out envelopes to all of our members who have given me photos. It was great for them to see a monetary response to their work. Bert Green kindly sponsored our entry fee for the Bazaar and made sure our paperwork was pushed through. The table was a great idea and I really enjoyed talking to so many people about the project. We also earned enough money to buy another camera! The next step is to update the website so that each member has their own blog, bio and gallery. Their galleries will also allow people to purchase prints online. I am going to try and have this done by year's end. I am looking forward to seeing more amazing work from our participants. Our next show coming up will open during the January Downtown Art Walk at Raw Materials. Come down and see the work if you get a chance! A folding table is covered with prints for sale from members of the Skid Row Photography Club.